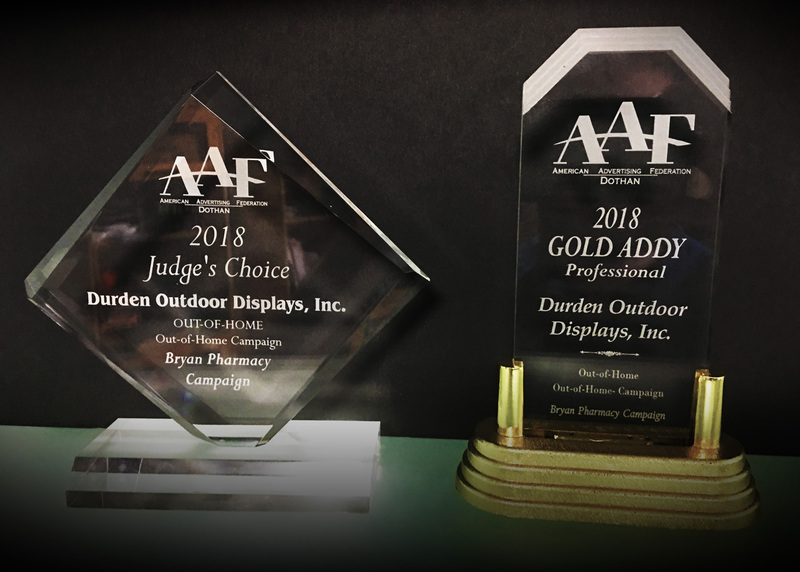 Whitaker Marketing came to Durden Outdoor with the idea of collaborating to promote their client Espy, Metcalf & Espy, P.C. Known as Dothan’s bankruptcy lawyers, EMEPC, have more than 60 years combined in bankruptcy law, and have helped thousands of individuals and families escape or decrease crushing debt burdens. The design process of Espy, Metcalf & Espy began with several creative meetings researching the topic, defining the direction, and strategizing about the possibilities. This is when the “Ball & Chain” concept emerged from our creative minds and leapt onto the dry erase board. The expression “ball and chain” refers back to the actual ball and chain, which was a heavy metal ball secured to a prisoner’s leg by means of a chain and manacle. The ball and chain was in use in both Britain and the USA by the early 19th century (and possibly much earlier.) The earliest citation in print is from The Times, January 1819. Now, it is used as a slang term for a burden that you must carry around with you. In our design the “Ball and Chain” is a metaphor for how debt can be a burden and weigh you down. 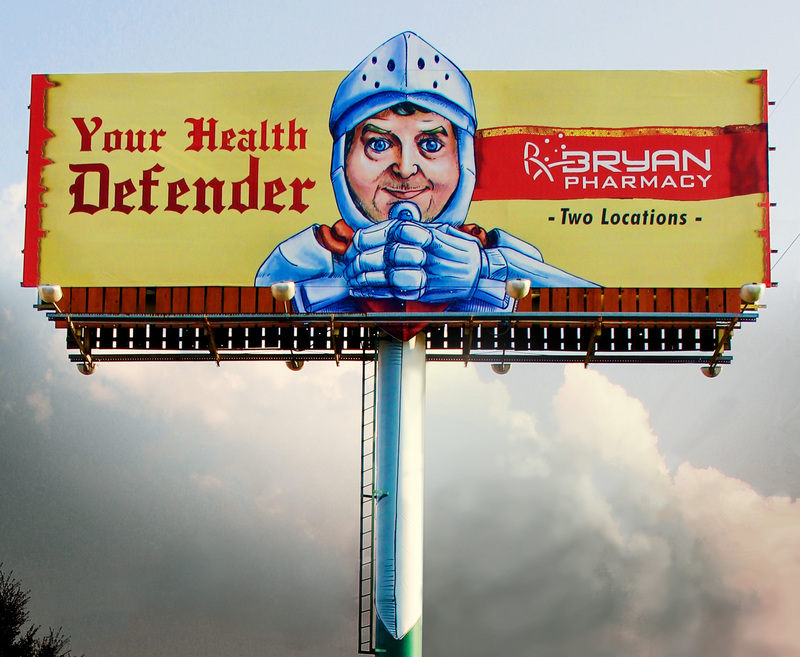 With the design sketched out, Durden’s Creative department began designing and revising the billboard. After a few ideas were mapped out the initial design was presented to the client for review. Once the concept was given a go-ahead the 3D idea developed while meeting with Durden’s production department. Excitement had sprung with this new 3D idea between all three entities! 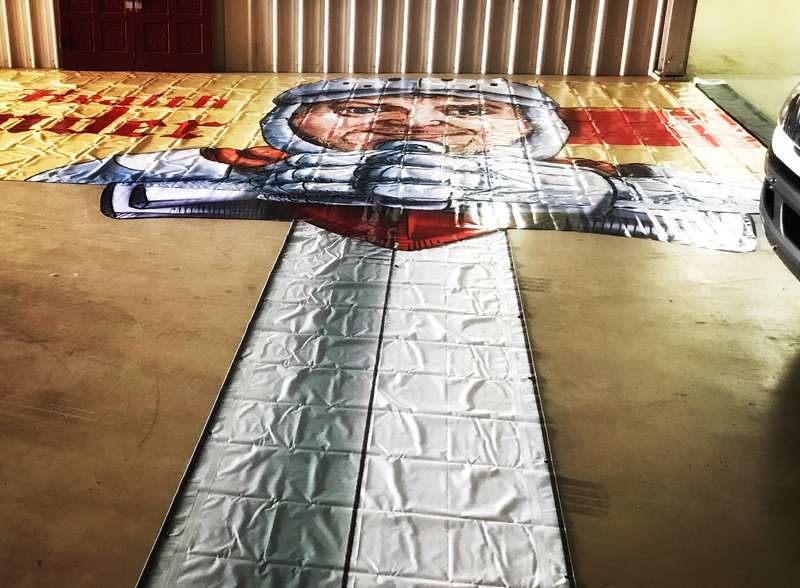 The artwork was approved and the agency decided to creatively spend their client’s ad budget on (1) stationary bulletin strategically located on Main Street in Dothan, Alabama [across from Wiregrass Church.] To add frequency and coverage to this “MY DEBT” ad campaign, they also included a digital rotary showing on our Durden Digital Network. The team at Durden then began engineering and building the 20 foot 3D Chain and Cuff to fit on the billboard. You can see how we made it by clicking HERE. Shortly after it was installed Sharon Whitaker, President of Whitaker Marketing, notified us that the client had already received a lot of positive feed back from their 3D billboard. Creating the RIGHT IDEA for the RIGHT CLIENT equals “FAMOUS” every time. Durden Outdoor was beyond ecstatic about developing and producing this billboard campaign for Whitaker Marketing and Espy, Metcalf & Espy, P.C.’s Bankruptcy Practice. 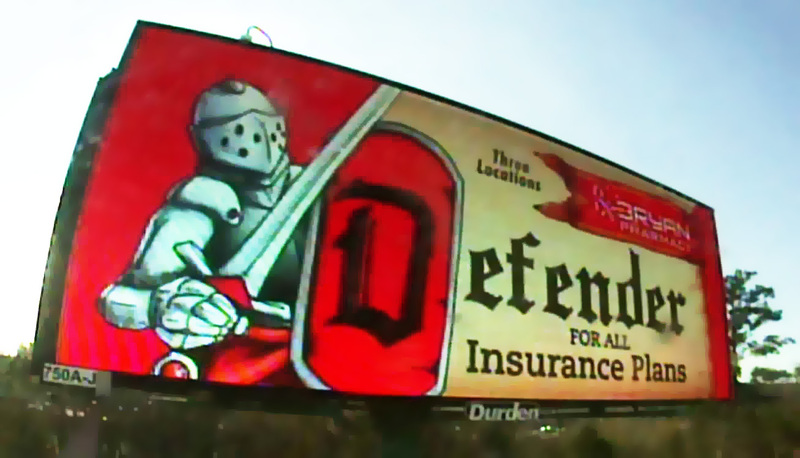 To find out how to add a 3D PROP BILLBOARD to your next marketing campaign, contact one of the FAMOUS MAKERS at DURDEN OUTDOOR today at sales@durdenoutdoor.com. 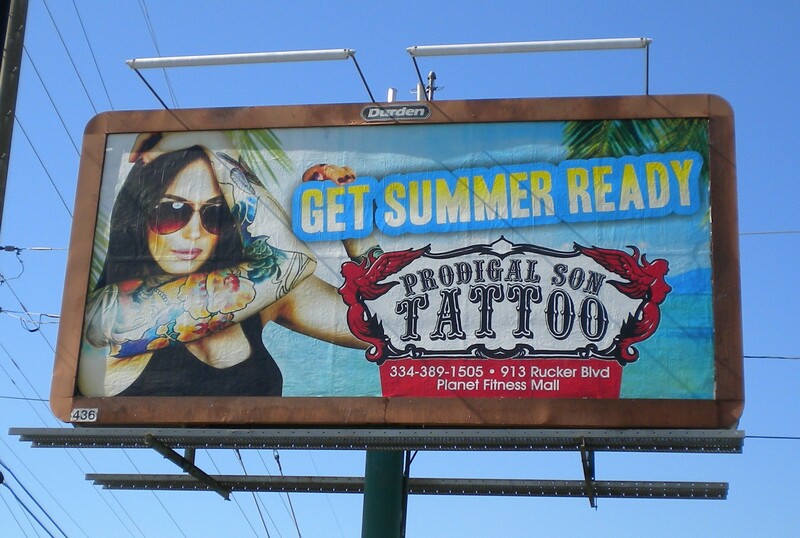 The power of one billboard can be huge if the message is right. Durden Outdoor teamed up with local Wrangler retailer THE BARN for this awesome TEASER | ANSWER board. THE GOAL: The client wanted to let locals & through traffic know that they are the BOOT & JEAN Capital of Alabama. THE IDEA: Build a 25 foot tall cowboy (in jeans) and put him on a billboard smack dab in the center of Dothan, AL. THE SIZZLE: The 2013 TOADLICK Music Festival was approaching April 11,12,13 and THE BARN was a sponsor of the event. We spoke to the festival promoters and they had tried to book country music star JASON ALDEAN because of popular demand, but were unable to book him for their 2013 event. So, how cool would it be if THE BARN could bring him to town? 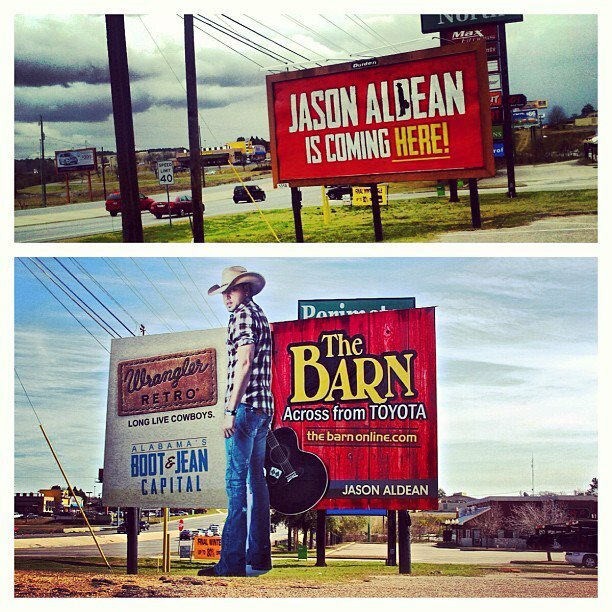 J THE TEASER: We put up a billboard for 4 weeks that simply said “JASON ALDEAN IS COMING HERE.” THE ANSWER: Our production team designed, built and installed a 25’ tall JASON ALDEAN on a low height billboard located on a major through fair (Hwy 231) in Dothan, AL with 38,000+ cars per day. THE RESULT: Huge Local Response & PR for our client. NEXT QUESTION: How can TEAM DURDEN make your next campaign FAMOUS? Jason Aldean has set the stage in country music. The singer has sold more than 7 million records and went double platinum with his 2010 album “My Kinda Party.” The recent release of his new album Night Train has everyone buzzing. His first single from this album, “Take a Little Ride,” has hit a three week streak at No. 1. You can read more about him on his website www.jasonaldean.com. The Barn, a local business, has been providing western and casual clothing to the surrounding area for more than 30 years. They carry top brands of clothes, shoes, boots, hats, and accessories for the entire family. With Jason Aldean being the face of Wrangler jeans, The Barn decided they wanted to be a part of all the hype. The Kreative team at Durden designed a campaign to market their products successfully. The Durden rotary poster, displayed for a couple of weeks, next to Conestoga Steak House on HWY 231 N, kept the Wiregrass pondering and curious about the artist’s where-abouts. Through social media motorists have been trying to find the answers. Will Jason Aldean come to Toadlick? The Durden team knows what he is up to. Stay tuned! 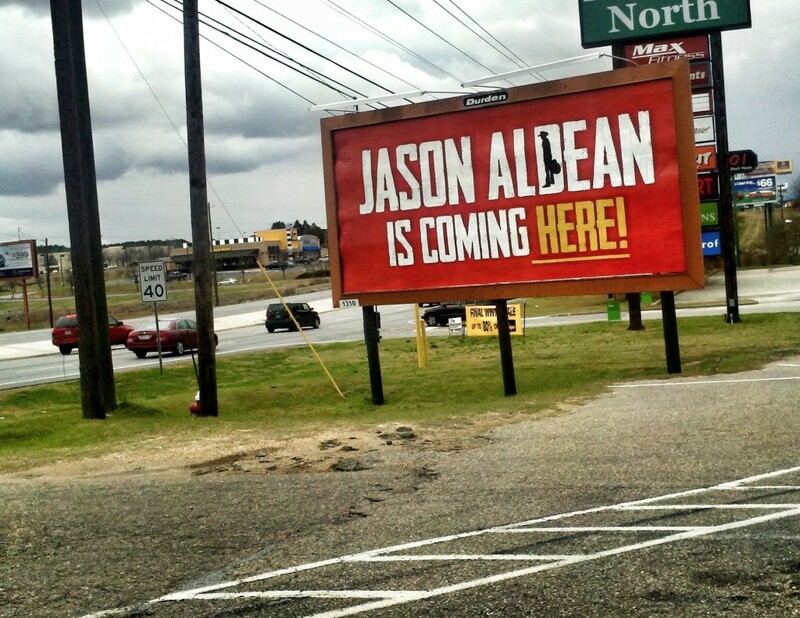 Have you heard the news about the Jason Aldean rotaty poster in Dothan? Yesterday a Jason Aldean is coming HERE rotary poster was installed next to Conestoga Steak House on Highway 231 North in Dothan, Alabama. This poster is will be replaced by a new message in a few weeks. For more information be sure to check out the billboard location in a couple weeks by Conestoga Steak House. Goldfingers is a Dothan based restaurant serving high quality chicken fingers, burgers, pizza, salads, wraps, and more. Be sure to check out the awesome sauce they have for their chicken fingers in any of their 3 Dothan locations. I have to admit I eat the sauce with my french fries and chicken fingers. Goldfingers has been working diligently to build brand identity as they launch their restaurant business into a full swing franchise. The initial phase with their restaurant advertising approach was to use the Durden Outdoor 4 Week Rotary Posters. Goldfingers received a new billboard location every 4 Weeks and altered the message slightly each month to keep the message fresh. 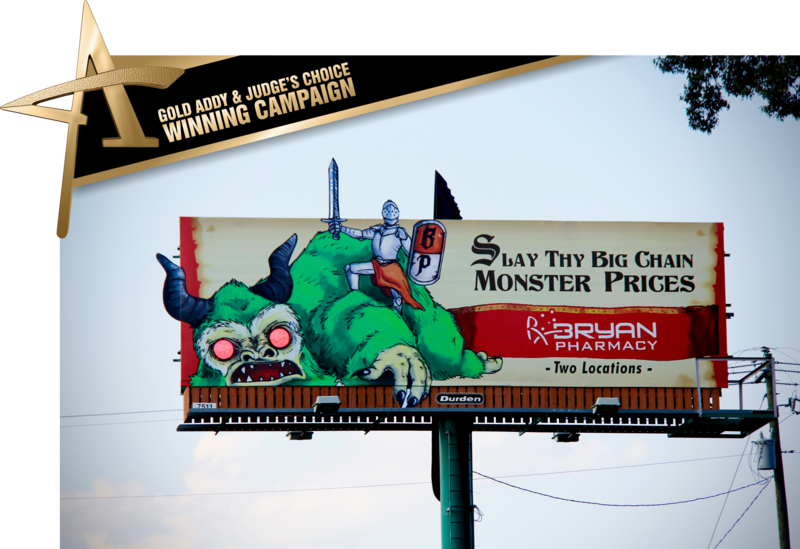 By using a total of 4 billboards per month they were able to capture a large section of the Dothan market. If you would like more information on the 4 Week Rotary program and its benefits be sure to contact our experienced marketing professionals for details.